Pro-Kurdish Peoples’ Democratic Party’s (HDP) local office in Istanbul’s Kadikoy district was raided by the police early Tuesday, according to several media outlets. 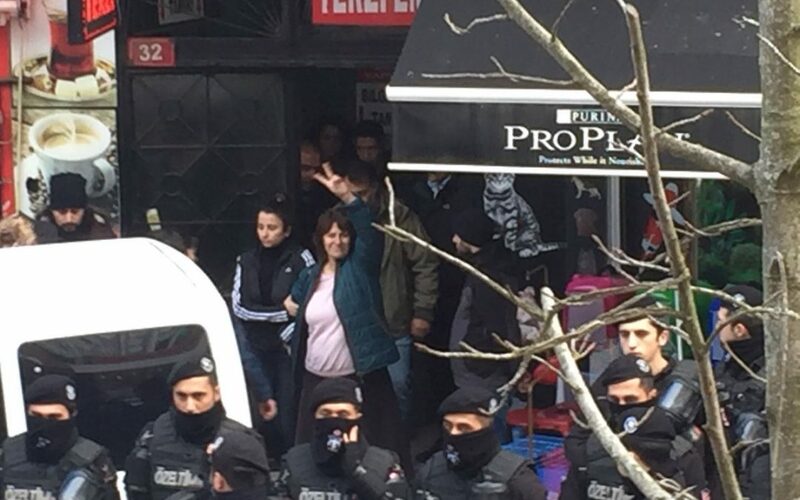 Following a four-hour search of the premises for prohibited publications and photos, police detained Gül Demir, co-chair of HDP district bureau. A detention warrant was issued for Ercan Demir, the other co-chair of the bureau. “Police have been trying to break into our district building. We call on our sensible supporters to gather in front of our building,” HDP Kadikoy said on Twitter. Meanwhile, 55 members of the HDP and the pro-Kurdish Democratic Regions Party (DBP) in the western province of Izmir the same day, Gazete Duvar said. Turkish government has stepped up political pressure on Kurdish minority in recent years, seizing Kurdish-run municipalities and arresting their mayors. Dozens of trustees have been appointed by the Interior Ministry to mostly pro-Kurdish municipalities in Turkey’s Southeast, replacing the elected mayors and municipal council members. Gökyüzünden, sokaklara; sokaklardan, zindanlara direneceğiz!